This is the first article in an occasional series exploring wealth and income inequality in Connecticut and its impact on a state struggling to cope with massive debt. Even within a nation racing dangerously toward unprecedented levels of income and wealth inequality, Connecticut stands apart. The gap between its richest and poorest citizens — and that between the top and the middle class — outstrips those in most other states, and in many other corners of the globe. Since the last recession, inequality in Connecticut has not been a simple case of hedge fund principals reaping rewards that dwarf a still-prosperous middle class. Rather, only the richest of Connecticut’s most affluent households, on average, have improved their standing. While economists and politicians differ over how to address the problem, those on all sides of the inequality debate generally agree there is an economic tipping point: when disparities become too extreme and too many are struggling. When adequate investment in human capital — higher education, adequate health care and decent housing — are impossible because of debt or under-employment, inequality becomes a significant drag on economic growth. Further complicating Connecticut’s struggle with accelerating inequality, the state is divvying up responsibility for paying a historic bill brought on by its own fiscal imprudence over decades: unprecedented pension and other debt costs that already are placing extreme pressure on services and taxpayers. How to address economic inequality and a crushing debt at the same time will be at the core of Connecticut’s political debate for years to come. Some warn against expensive government social programs and economically stifling taxes that could drive Connecticut’s richest citizens from the state in droves. 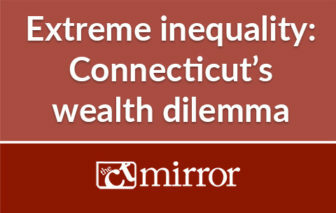 Others counter that inequality not only takes a heavy toll in human collateral damage — galvanizing racial divides and restricting access to health care, education and affordable housing — but also undermines Connecticut’s economy faster than any potential exodus of millionaires. Collectively, these trends threaten more than Connecticut’s most vulnerable citizens, but also the state’s economic future. Inequality of resources has been a source of tension — sometimes subtle and sometimes overt — throughout history. Just as some say greater rewards are crucial to encourage people to work harder, others say extreme disparities leave too many unable to prosper, sinking into despair and dependence upon others. But over the last century, inequality of income — how much a household earns or receives annually from various sources — has largely been a two-part story. 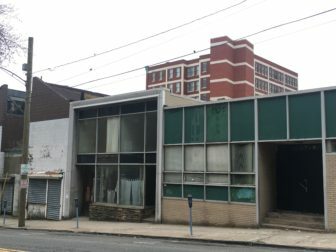 Between 1928 — one year before the stock market crash that launched the Great Depression — and 1979, disparities in income steadily shrank nationally, and in every state except Alaska, according to a 2016 analysis by the Economic Policy Institute of Washington, D.C., a nonprofit, nonpartisan think tank. Rising minimum wages, low unemployment — after the 1930s — and widespread growth in collective bargaining in private industries shifted the landscape dramatically. But since then, the pendulum has swung toward inequality, and has accelerated considerably since the last recession ended nearly one decade ago. Over the five decades ending in 1979, the top 1 percent saw their share of the nation’s income decline, the EPI study reported. In Connecticut, it fell from 24 percent to 11 percent over that period. Between 1979 and 2013, though, the top 1 percent rebounded to 20 percent of all income nationally, and nearly 30 percent in Connecticut. Why did conditions flip-flop? Economists cite several reasons. Globalization of Trade. In the last 40 years, the nation’s economy has become increasingly reliant on imports, particularly from China, reducing the number of domestic jobs available. Since the late 1990s, the nation’s trade deficit generally has worsened, and a rebound in 2008 and 2009 was not enough to reverse that trend. Meanwhile, economists say, lost manufacturing and computer software jobs often have been replaced by lower-paying service sector positions. Government Institutions. Starting in the late 1970s and accelerating with the presidencies of Ronald Reagan and George H.W. Bush, U.S. governmental policies have emphasized deregulation, de-unionization and less progressive income tax rates. Technology and education. As technology advances, the need for many jobs — particularly among unskilled workers — is eliminated. A March 2017 forecast from PricewaterhouseCoopers warned that 38 percent of U.S. jobs are at high risk of automation by the early 2030s. Meanwhile, the cost of public colleges and universities rose faster than inflation, as state governments generally asked families to absorb more college costs. The rate of annual growth for college tuition nationally between 1980 and 2014 more than doubled that of overall inflation, according to the U.S Department of Education. Wealth Concentration. This theory holds that inequality tends to worsen in a vicious cycle. In most cases, newly created wealth is concentrated among the already wealthy, who have the resources necessary to invest in new products, services and skills. While it took about three-and-a-half decades to roll back the push toward equality from the previous 50 years, it was the four years beginning with the last recession that really left its mark. Simply put, the trend toward inequality shifted into high gear as the country, and Connecticut, entered its worst economic downturn in eight decades. The top 1 percent nationally captured 85 percent of all income growth between 2009 and 2013, leaving the remaining 99 percent — on average — to share the remaining 15 percent, according to the EPI analysis. Overall, the top 1 percent nationally emerged earning 25.3 times annually what the bottom 99 percent earned, on average. But in 10 states, including Connecticut, the numbers were even more extreme. Here the top 1 percent took home 100 percent of the income growth over that period. Specifically, the top 1 percent got 17.2 percent richer, on average, while the remaining 99 percent didn’t grow more slowly. They actually got poorer, losing 1.6 percent of their income. In Connecticut, the top 1 percent out-earned the rest by 42.6 to 1 — one of just six states with a gap greater than 30-to-1. Only in neighboring New York was the ratio higher at 45.4 to 1. And Connecticut’s wealthiest out-earned their New York neighbors, on average, by almost $400,000. The average income of the top 1 percent of households in Connecticut was $2.4 million in 2013, while the bottom 99 percent average $56,445, according to EPI. Nationally, the top 1 percent earned $1.15 million on average while the bottom 99 made $45,567. Just to make the cut in Connecticut it meant a household income had to top $659,979. Nationally the bar was set at $389,436. A 2016 analysis from Connecticut Voices for Children, a New Haven-based, progressive public policy advocacy group, found the ratio at its most extreme in Fairfield County, where much of the state’s wealth and its financial services sector is located. The average income of the top 1 percent in Fairfield County was $6.06 million — 73.7 times greater than the $82,222 average income for the bottom 99 percent. But Carstensen said the problem of income inequality is modest when set against wealth disparities. Think of wealth inequality as income inequality’s big brother. While income is limited to the earnings one household receives over a set time — usually a year — wealth incorporates stocks, property and other assets a household possesses, as well as the mortgages and debts that burden it. 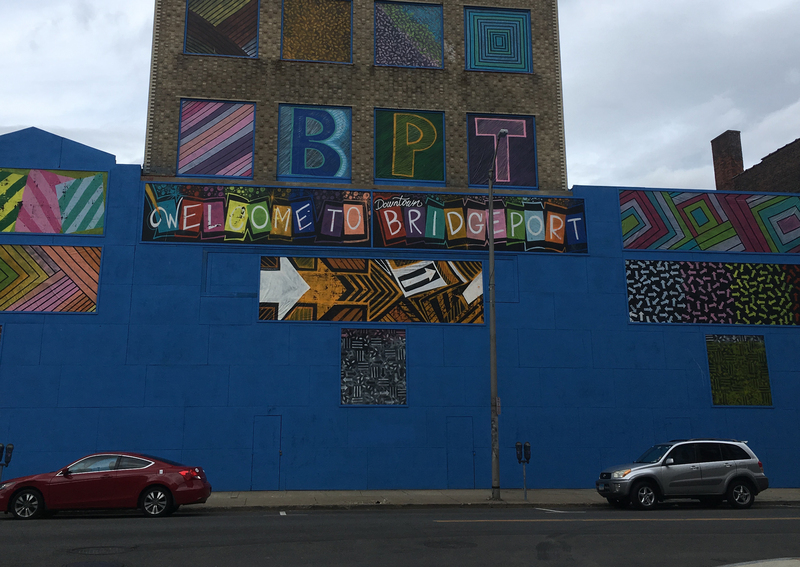 Blighted buildings face Bridgeport’s Superior Court on Golden Hill Street. One popular barometer of wealth in the U.S. is Forbes magazine’s list of the nation’s 400 wealthiest Americans. In 1982, the average member of that list had a net worth of $230 million. By 2016, the average member was worth $6 billion — after adjusting for inflation — and needed at least $1.7 billion just to make the list. According to the Congressional Budget Office, the top 10 percent of the nation’s richest families held two-thirds of the nation’s wealth in 1989, compared to 30 percent for those in the 51st through 90th percentiles and 3 percent for the bottom half. By 2013, the split was 76 percent for the top 10 percent, 23 percent for the 51st through 90th percentiles and just 1 percent for the rest. Over that period, wealth had grown by 153 percent in the top group and 4 percent in the middle, while the bottom half’s holdings had declined by 19 percent. For the middle class, declines in housing values took a big bite out of their overall wealth. And for both the middle class and the poor, non-mortgage debt — credit card balances, consumer loans and student loans — became a much bigger problem. The CBO found that especially after 2007, the numbers of families with more debt than assets increased, as did their average indebtedness. For example, 8 percent of families had more debts than assets in 2007, and they were $20,000 in debt, on average. By 2012 it had grown to 12 percent of families with an average of 32,000 in debt. And for the poorest 25 percent of Americans, families held an average debt of just $1,000 in 1989, $2,000 by 2007, and $13,000 by 2013. While many studies break income inequality down along state lines, few do so when it comes to wealth. Still, there is evidence that many of the national wealth trends are reflected here. How Connecticut responds to growing wealth and income inequality may be the defining debate that charts the state’s future for many years to come, according to Ellen Shemitz, executive director of Connecticut Voices for Children. Why? Because, although Connecticut has a reputation for having a very generous safety net for the poor and disabled, it is not what it used to be, social service advocates say. Connecticut has, on average, a child poverty rate of 15 percent — one in seven kids raised under these circumstances. This is better than the national average, which is closer to one in five. But some sections of Connecticut are well below the national average. In Bridgeport, the ratio is one in three. In Hartford, it is about 1 in 2, or 53 percent. A University of Connecticut analysis in 2011, just after the Great Recession, found that, despite having the highest per capita income of any state, Connecticut ranked among the bottom four in terms of the percentage of that income used to fund public services. Child poverty levels have increased statewide by 50 percent since 2000, Horan said. With lower- and middle-income households in Connecticut losing income, on average, during the first four years after the last recession, and with debt costs steadily absorbing more of the state budget, social services advocates say the trend is clear. Higher education, quality elementary and secondary schools, health care, decent housing and retirement security are becoming harder for many Connecticut households to attain. In addition, Shemitz said, wealth disparities galvanize racial divides in so many of these areas — harming many households now and threatening the state’s economic future. Harding High School in Bridgeport. A coalition of parents, teachers and local elected officials has asked the state Supreme Court to reconsider its January ruling that the state provides students from impoverished communities the minimally adequate education the Connecticut Constitution requires. The justices denied that request. 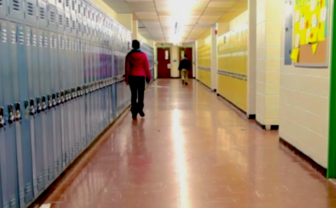 Suspension rates in the state are four times higher for black students than for whites. Chronic absenteeism is 2 1/2 times higher. Graduation rates are 16 percent less. And black students comprise just 7 percent of gifted and talent enrollment in Connecticut schools. Educators long have argued children from poverty-stricken neighborhoods are more are risk of developmental delays, poor nutrition and many other obstacles to learning than students from more affluent suburbs typically face. And they also insist there is a correlation between these problems and communities’ taxable property wealth. In other words, those municipalities with a more valuable tax base usually have students, on average, with fewer impediments to learning. Meanwhile, lower- and middle-income families also are struggling with higher education costs. Tuition and fees at public colleges and universities rose dramatically after the last recession. Between 2010 and 2017, tuition and mandatory fees for an in-state resident attending the University of Connecticut rose by 35 percent. Over the same period, the increases for the Connecticut State University and community college systems were 25 percent and 23 percent, respectively. According to the nonprofit Institute for College Access and Success, the average debt held by a Connecticut resident graduating college — public or private — rose from $18,906 in 2004 to $29,750 in 2014. That 57 percent increase was topped by graduates from just six other states. Another major change in the 1990s and the 2000s involved a major overhaul of the private pension system. According to a 2014 analysis of wealth by the National Bureau of Economic Research, 46 percent of all households held a defined-benefit pension plan in 1989, but just 34 percent did by 2007. Many of these pension plans were replaced with defined-contribution plans, typically 401(k)s and Individual Retirement Accounts or IRAs. The share of households with these plans, nationally, rose from 24 percent in 1989 to 53 percent by 2007. In other words, some of the wealth that middle class and poor households reportedly gained in the 1990s and 2000s simply involved the substitution of one retirement plan for another. In 2016, the Connecticut legislature began a process to make government-administered, 401(k)-style benefits available to private-sector workers who lack access to any type of retirement plan. Comptroller Kevin P. Lembo estimates close to 600,000 Connecticut residents need this alternative. “There is an entire generation of employees, many of them lifelong hardworking middle class people, who are headed to retirement financially unequipped, in part due to lack of access to a workplace-based retirement savings option,” the comptroller said when the program was authorized. Access to sufficient health insurance, Carstensen said, is another key factor in wealth disparity across the United States. In many cases, a majority of low-income households’ debt involves health care bills in arrears. And while Connecticut’s reputation is one of having one of the most generous social safety nets in the nation, its track record has been “a mixed bag” since the last recession, according to Patricia Baker, president and CEO of the nonprofit Connecticut Health Foundation. The federal Affordable Care Act added Medicaid coverage for an estimated 200,000 Connecticut residents, with 90 percent of the funding needed to cover that provided by Washington. “We have an infusion (of funding) we need to be grateful for,” Baker said. But at the same time, Connecticut has begun to peel back assistance for some of its poorest working residents. Despite pledges from Gov. Dannel P. Malloy and others not to “shred” the safety net, “what we have seen in terms of state revenue, the dollars available to keep that safety net in place have continued to be eroded and eroded,” Baker said. In 2015, Connecticut legislators tightened eligibility for the Husky A program, reducing Medicaid health coverage for an estimated 23,700 adults earning between 201 percent and 155 percent of the federal poverty level. In 2015 dollars, that meant a family of three earning between $40,380 and $31,139 lost coverage. And health care advocates also estimate 80 percent of those removed from the rolls could not afford to purchase insurance on the state’s health care exchange. Lawmakers ordered a second tightening in 2017, from 155 percent to 138 percent of the federal poverty level — a limit of $28,676 for a family of three. This would have removed coverage for another 13,500 families, but the General Assembly reversed that decision in early May. But Baker said the problem goes far beyond the Husky program. Federally qualified health centers and school-based clinics here have lost significant funding since the last recession, and these are key “access points” for health care for minority adults and children. 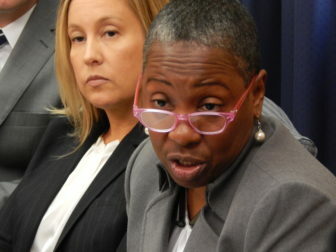 Five cities in Connecticut contain more than 50 percent of the state’s Medicaid population, she said. “I don’t think anybody wants this to happen necessarily, but you see this gradual death by 1,000 cuts,” she said, adding Connecticut cannot solve its fiscal crisis solely through austerity. Who pays for CT’s huge fiscal mess? Looming behind all of these inequalities are two huge challenges. The first is to figure out who is going to pay the bill for state government’s massive debt, most of which is tied to poorly funded retirement benefit programs. Connecticut has nearly $80 billion in long-term obligations — a burden the state Commission on Fiscal Stability and Economic Growth says is closer to $100 billion, if more realistic assumptions are applied to pension fund investment projections. Analysts say paying pensions for municipal teachers and pensions and retirement health care for state employees will place unprecedented pressure on state finances for the next 15 to 20 years. All of these programs suffer from more than seven decades of inadequate savings ordered by numerous legislatures and governors. In 2007, just before the last recession, retirement benefit costs and payments on bonded debt represented about 17 percent of the budget’s General Fund. Not surprisingly, legislators, other state officials, unions, study panels and various advocacy groups have spent much of the past few years trying to solve one question. How should the bill for Connecticut’s legacy of debt get divvied up? And should wealth and income be a factor in determining who pays? Public-sector employee unions, legislators from Connecticut’s poorest districts, social service advocates continue to press for higher taxes on wealthy households. “Since the inception of the state income tax” in 1991, “the income tax avoidance industry for the wealthiest taxpayers has flourished,” Donald Williams, executive director of the Connecticut Education Association, said in February while testifying before the state’s fiscal stability panel. Hartford attorney Daniel Livingston, who bargains for all state employee unions on benefits, rejected the argument that Connecticut’s rich will flee if taxed more, citing a 2016 study by Stanford University and U.S. Treasury analysts. But businesses, most Republican legislators, and a fair number of Democrats in state government — including Malloy — urge varying degrees of caution about asking the wealthy to pay more. The fiscal stability panel sparked fierce debate, but little consensus, earlier this spring. The 14-member commission’s report featured a wide array of recommendations centered on a major redistribution of state taxes — primarily reducing income-tax rates across the board while boosting the sales and corporation levies. But because the wealthy pay the majority of state income taxes, they also would benefit disproportionately from a rate reduction. And even though the panel recommended raising the state’s minimum wage to $15 per hour, critics said overall it was a blueprint to worsen inequality in Connecticut. A member of the legislature’s Appropriations Committee, Porter took the fiscal stability panel to task during a March 23 public hearing. 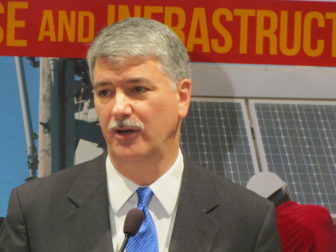 Porter questioned why the commission says the income tax adjustments and other changes that benefit the wealthy — such as eliminating tax on estates valued at more than $2 million — should occur quickly, while a proposal to bolster the minimum wage to $15 per hour should be implemented gradually, taking until 2022. “Why do we have to wait? Why do they get immediate relief and we get gradual relief?” she asked, adding that severe income inequality also strongly reinforces racial inequality. “Having a strong economy makes us able to make the kind of investments (in cities) you would like to make,” commission co-chairman Jim Smith, who also is chairman and former CEO of Webster Bank, responded to Porter. Cindi Bigelow, CEO of Bigelow Tea and a member of the state’s fiscal stability panel, put it more succinctly at a commission meeting earlier in the year. “We want to make sure we are protecting the wealthy because they will just leave,” she said. Ray Dalio, founder of Westport-based Bridgewater Associates, one of the world’s largest hedge funds, asserts Connecticut’s wealth dilemma is more complicated than that. In a December op-ed piece in ValueWalk.com, an online financial services news site, Dalio wrote that Connecticut and other states that face higher federal tax burdens because of the new limits on state and local tax deductions face a quandary. Finding a balance in Connecticut? So what’s the solution? How do you reduce inequality and boost economic growth when major tax hikes — while helping with the former — would be a drag on the latter? There’s consensus there are no easy remedies to severe income and wealth inequality — let alone in a state grappling with major debt issues. The centerpiece of the fiscal stability commission’s plan was a major redistribution of state taxes, primarily reducing income-tax rates across the board while boosting the sales and corporation levies. But it ran into criticism from legislators from both parties, for different reasons. Because the wealthy pay the majority of state income taxes, they also would benefit disproportionately from a rate reduction, while the middle class pays much of the sales tax. Democrats objected to this shift. Some Republicans balked at raising the sales and corporation taxes. After big state tax increases in 2011 and 2015 to close major projected deficits, legislators and Malloy have steered clear of big hikes in the last three years and focused on spending cuts. But legislators from both parties have acknowledged that state finances are not projected to remain stable, and Connecticut’s recovery from the last recession still lags the nation. Having regained just 80 percent of jobs lost from the last downturn, Connecticut is the only state that has not achieved a full recovery. A 2014 study of the U.S. and 22 other countries in North America and Europe suggested a different tack: targeting the lower portion of the inequality spectrum. Countries that had dramatically reduced poverty enjoyed more robust economic growth than those that had produced extreme degrees of income inequality. Some degree of tax hikes, by raising top marginal rates and closing deductions, “which tend to benefit high earners disproportionally” may well be necessary. But the other key is to use those funds to increase access to public services, including high-quality education, job training, transportation and health care. Connecticut is not doing enough to prevent “the hollowing out” of the middle class, Carstensen said, adding that simply trying to keep tax rates down and attract more multi-millionaires to the state isn’t the answer. The second article in this series, to be published Wednesday, will examine vast disparities in municipal spending and the resources available to Connecticut’s poorest cities and most affluent towns. How wealth and income inequality galvanize the racial divide in Connecticut. The struggles of Connecticut’s poor and middle-income families to preserve access to quality education, health care and social services. The debate over raising tax rates on rich households and major corporations amid fears of an accelerating wealth exodus from Connecticut. The competing theories of how the state should resolve massive public-sector pension obligations and other debts.